Around 130 million years ago, two neutron stars — those strange, compacted cores of dead stars — smashed into one another. The resulting “kilonova” explosion sent ripples through space-time and hurtled heavy metals like platinum and gold into space. Now, astronomers have detected the signals from that long-ago collision, in the form of gravitational waves and electromagnetic signals. The discovery was announced in October alongside a flurry of scientific papers documenting the findings. In the past, LIGO scientists have recorded gravitational waves from merging black holes, but this is the first time gravitational waves have been detected alongside electromagnetic signals from the same source. “There is an incredible range of new science here and it’s really hard to pick out what’s most exciting,” says University of Chicago astrophysicist Daniel Holz, also a member of the LIGO Scientific Collaboration. As he explains, scientists have long theorized that gravitational waves move at the speed of light, but the waves from this collision finally confirmed it. “We showed that gamma rays and gravitational waves … after traveling for over 100 million years, they arrived at Earth within two seconds of each other,” he says. Likewise, take a hard look at any jewelry you’re wearing and consider that for a long time, we haven’t had a good explanation for where heavy metals like gold and platinum come from. According to Holz, the Big Bang explains the creation of some lighter elements like hydrogen and helium. “And then those elements form stars, and the stars burn and produce heavier elements, and that story works all the way to iron … but not past iron,” he says. In fact, scientists estimate the recently discovered neutron star collision spewed out 200 times the mass of Earth — just in gold. But collectors, fear not: The metal is still precious, as is the event that made it. “In a galaxy like our own, these collisions maybe happen a dozen times, maybe a few dozen times per millions of years,” Kalogera says. But beyond gold, there’s another aspect of the discovery that has Holz particularly excited. He says information gleaned from the collision is giving scientists a new way of measuring the expansion of the universe. Vicky Kalogera is the Daniel I. Linzer Distinguished University Professor in the Department of Physics and Astronomy and Director of the Center for Interdisciplinary Exploration & Research in Astrophysics (CIERA) at Northwestern University in Evanston, Illinois. Daniel Holz is an associate professor in the Departments of Astronomy and Astrophysics, Physics, and the Enrico Fermi Institute at the University of Chicago in Chicago, Illinois. IRA FLATOW: This is Science Friday. I’m Ira Flatow. About 130 million years ago, two neutron stars collided, and that collision created a universe shaking explosion so big astronomers are calling it a kilonova that rippled space-time and splattered the cosmos with a cocktail of heavy metals, including lots of gold, about 200 times the mass of Earth in gold. This week astronomers announced that they had spotted the signals from that collision both in gravitational waves, like waves like the ones LIGO detected from merging black holes, and in signals across the range of the electromagnetic spectrum from optical light to gamma waves. It sounded like this. Oh, that little chirp right there at the end. I hope you could hear that because it was kind of faint. And joining me now to talk about what makes that observation so important and what it means for our understanding of the universe are my guests– Vicky Kalogera is a professor in the Department of Physics and Astronomy at Northwestern University in Evanston, Illinois. She’s also a member of the LIGO Scientific Collaboration. Welcome. VICKY KALOGERA: Hi, happy to be with you. IRA FLATOW: Nice to have you. Daniel Holtz is an associate professor at the University of Chicago and the Kavli Institute for Cosmological Physics and a member of the LIGO Scientific Collaboration as well. Welcome, Daniel. DANIEL HOLZ: Thank you. It’s so great to be here. IRA FLATOW: Dr. Kalogera, tell me exactly what exactly did astronomers see, what was the signal, or all the signals. VICKY KALOGERA: Well, what’s amazing with this discovery is that we didn’t just see, but we actually also heard. So first on August 17th early on, we heard more than 100 seconds of gravitational waves coming from the in-spiral, the death spiral of a pair of neutron stars. They were going one around the other until they came so close that they actually collided. So the gravitational waves came first, and we heard them with the LIGO detectors– laser interferometers in the US. And then two seconds later, a cascade of waves across the whole electromagnetic spectrum started. It started with gamma rays, the most energetic light we have and continued with optical light, also later x-rays, and eventually radio waves. That continued over hours, days, and weeks. This combination of gravitational waves and electromagnetic waves coming from one cosmic source has never been observed before. So this was one amazing first. IRA FLATOW: And Dr. Holz, why is this such a big deal? What do we learn from neutrons colliding that we would not know from black holes colliding? DANIEL HOLZ: There is an incredible range of new science here. And it’s really hard to pick out what’s most exciting. I mean, we learn about speed of gravitational waves. We’ve now learned that the speed of gravity is the same as the speed of light. We’ve learned where the gold and the platinum in the universe is made, or at least a good fraction of it. We’ve also been able to measure the scale of the universe in a whole new way. I mean, these are all completely new developments all from this one discovery. IRA FLATOW: Our number, 844-724-8255 if you’d like to talk about it. You can also tweet us @scifri. Dr. Kalogera, explain for us what a neutron star is, how big it is, how it’s different than a black hole. VICKY KALOGERA: So a neutron star is actually the most compact star that nature can form. And it is still not as compact as a black hole. But it’s still a star in the sense that it is really made of matter, regular particles, primarily neutrons. And that’s why we call it the neutron star. Now it comes from the demise of very massive stars about 10 or 20 times the mass of the sun. When those stars ran out of nuclear fuel, they cannot not support themselves against their own gravity. So the inner parts of those stars collapse under their own gravity. But eventually they don’t become black holes. They don’t become points. But instead they manage to support themselves because of nuclear pressure, and they manage to become neutron stars. Now these are very small. They’re as big as– since both Daniel and I are in the Chicago area– they are about the size of the city of Chicago. But they have a mass which is 1 and 1/2 times the mass of the sun. One teaspoon full of that neutron star matter is as heavy as the whole mountain of Everest. VICKY KALOGERA: So this is extremely dense matter, which has very peculiar properties. We don’t have these kinds of properties on our planet. So the only way to study this kind of material is really by studying cosmic sources like this collision. 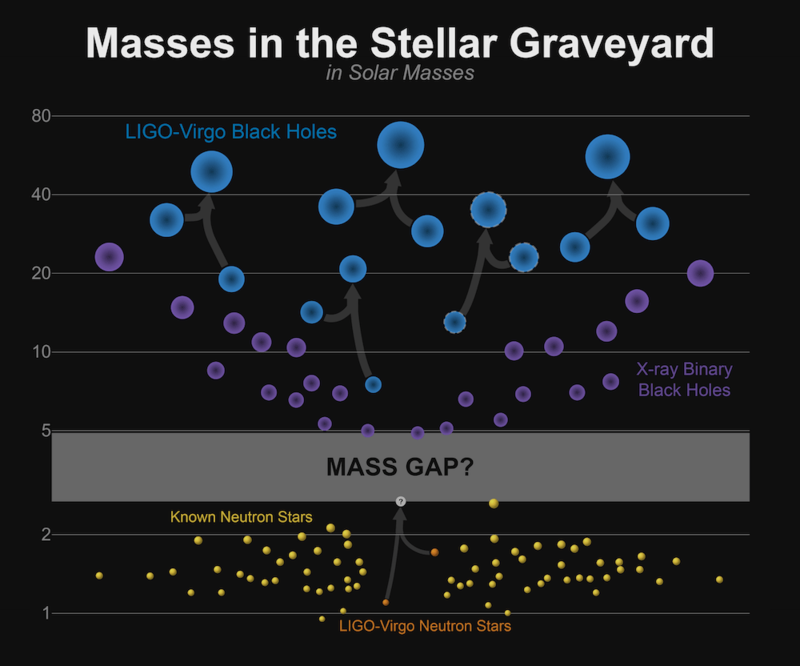 IRA FLATOW: And how do you know from looking at the data that last year’s observations were black holes merging, and this event is neutron stars? How do you know that? VICKY KALOGERA: So this we know in two different ways. First, the gravitational waves signals are very different. So they both have this characteristic sound that you played in the beginning of the segment, which was the chirp like sound– whoop– except, when it is neutron stars, the signaling gravitational waves is much longer. So we heard it play much longer. In this case, it was more than 100 seconds. So long signals imply small masses. And that tells us that we are dealing with neutron stars given what else we know in astronomy and astrophysics. But there is now, one might ask, why wouldn’t it be small black holes, about 1 and 1/2 times the mass of the sun but black holes. IRA FLATOW: Yeah, I’ll ask it. VICKY KALOGERA: And there we need the electro-magnetic waves. The fact that we saw light right after the collision means we had at least one neutron star. IRA FLATOW: That’s really interesting. And Dr. Holz, a lot has been made about how much gold came out of this collision. What is the connection between this event and the heavy metals like gold in there? Why so much? DANIEL HOLZ: Well, one of the interesting things about the way the elements are made– so we have a very nice picture of how this is all made from the very big bang, where the big bang makes some lighter elements like hydrogen and helium and then those elements form stars and the stars burn and produce heavier elements. And that story works all the way to iron. And it works very well, and it kind of accounts for everything we’ve seen– but not past iron. So heavier elements like gold and platinum– we’ve had trouble explaining how there is as much gold and platinum as there is, for example, in our galaxy when we make observations. And this now helps address that question. What we’ve seen through measuring the light, through measuring everything with our optical telescopes and these other telescopes, what we’ve now measured are signatures that indicate all these heavier elements are being made and they’re being spewed out into the galaxy where this thing resides. And so we’re actually watching the movie of the formation of that gold and platinum, and a lot of it as you said. It’s many, many times the mass of the Earth in gold and in platinum. There’s also uranium. There are a bunch of other things being produced and then being spewed out. And so now we can say this is where it all comes from. IRA FLATOW: Do we know– do we think that these collisions are common, producing gravitational waves between either black holes or gravitational waves from neutron stars– pretty common? DANIEL HOLZ: You can go, Vicky. VICKY KALOGERA: It’s OK, Daniel. We both know the answer. So I would say– so we have had suspicions of how common these collisions are. But with this one observation, we’ve actually gotten a much better picture. It turns out that they are very rare as we expected. But not as rare as they could have been. So in terms of numbers, in a galaxy like our own, these collisions maybe happen a dozen times, maybe a few dozen times per millions of years. So that’s rare. IRA FLATOW: That’s rare, but they could be coming in from other parts. My question is, if these are coming from different places, different neutron stars, let’s say, or different black holes, and they’re actually warping the space around them and sending a wave, a gravitational wave, what happens if two of them meet, two gravitational waves one from two different collisions meet in space? What happens at the juncture, like the ripples in the pond– two ripples when they meet– what happens to the gravitational wave? DANIEL HOLZ: So what’s interesting about that is the very first paper I ever wrote– the very first project when I was an undergraduate– was on that specific question. And I showed that if you had really strong gravitational waves crashing into each other, you could make black holes. But for what we’re talking about here, with our detectors on Earth, we had to build a state of the art detector. We pushed the technology to the very edge, and we barely, barely detected anything. And so even if we had multiple sources of gravitational waves all coming at the same time, it would still barely register. Unfortunately, it’s very difficult to make extremely strong waves all colliding in the same place. IRA FLATOW: So it’s not like– I’m thinking waves in a pond. You see how they build up– waves in the ocean. But you’re saying these are so weak, you wouldn’t get any buildup. DANIEL HOLZ: That’s exactly right. IRA FLATOW: And we’re also thinking of standing waves, things like that. DANIEL HOLZ: That’s right. I mean, it would be great if we could do stuff with these waves. But we haven’t come up with a way to do that. IRA FLATOW: Well, I’m thinking, if the waves come together and they crest really high– so if you’re warping space-time like that, could you tunnel through it and get to the other side in shorter amount of time? DANIEL HOLZ: To be honest, part of the inspiration for that first paper was this analog of these rogue waves in the ocean, where every now and then you get this massive wave because everything comes in phase. And it’s exactly as you said. If you have, in principle, really strong gravitational waves, they could generate this huge curvature of space-time and just collapse that black hole. But we don’t think that happens. IRA FLATOW: Let me see if I can get a phone call in. Let’s go to Wayne in Warner Robins, Georgia. Hi, Wayne. WAYNE: Hello. Thank you for letting me on the show, the radio. My question to your panel is that, is the gold that we have here on earth made here on earth or did it come from outer space from this neutron planet implosion, or explosion. IRA FLATOW: Good question. So the gold we have here on earth is from some collision of neutron stars? What do you think? DANIEL HOLZ: My money would be on that it’s coming from something what we call a kilnova, exactly these sorts of things– that sometime in the past, probably many millions of years ago, there was a collision like this in our Milky Way galaxy. And it spewed a bunch of gold out and– actually, this would be probably much, much longer now I’m talking about it. It’d probably be billions of years ago. And when the Earth formed, some of that gold was part of its formation. IRA FLATOW: You just blew my mind on this thing. VICKY KALOGERA: That gold exists in the gas that surrounds the sun. It becomes planets. It goes into our mountains, and we get it in the mines. And we make our jewelry and our watches. But it’s not made in the earth. It pre-exists. IRA FLATOW: I’m Ira Flatow. This is Science Friday from PRI, Public Radio International, talking with Daniel Holz and Vicky Kalogera, who just, as I say, blew my mind. This gold is much more valuable then. When you think of where it came from, how much more valuable it must be? DANIEL HOLZ: Well, and you can see part of the reason we’re so excited now– I mean, to have figured this out. It’s pretty good. IRA FLATOW: So is this part of the excitement of the neutron star collision discovery? I mean, what other things are blowing your mind about this discovery? Are you measuring the universe more accurately or are we measuring constance more accurately? DANIEL HOLZ: So something I’m particularly excited about is this ability to measure the expansion of the universe much more accurately, or at least in a completely different way. And so by using this event, by the fact that we’ve detected it both in gravitational waves and in light, we can do an absolutely unique sort of measurement that we’ve talked about and we’ve wanted to do for a long time, but we’ve never been able to do before. And now we’ve done it, and we can measure this expansion– how quickly the universe is expanding around us right now. And by doing that, we get an overall sense of the scale of the universe and the age of the universe. And it’s beautiful. We’ve done the measurement. IRA FLATOW: And have we had to change our idea about that yet? Do we know what it is? DANIEL HOLZ: We know what it is. There are still some errors. It’s the very first time we’ve done it. But it’s consistent with what we’ve known before. and the whole picture just kind of fits together. And that’s remarkable because we’ve never been able to do this before. And yet, it all kind of works. VICKY KALOGERA: There is one other first with this discovery. I mean, it’s amazing. As Daniel said earlier, there’s so many scientific new conclusions we’re drawing in one event that we’re all excited. The other first is that we’ve had, for 50 years, explosions and gamma rays that we’ve been observing. They started our observations– in the community, started in the late 60s. And over the 50 years, we have suspected theories developed that maybe they are coming from collisions of two neutron stars. But we never had proof. 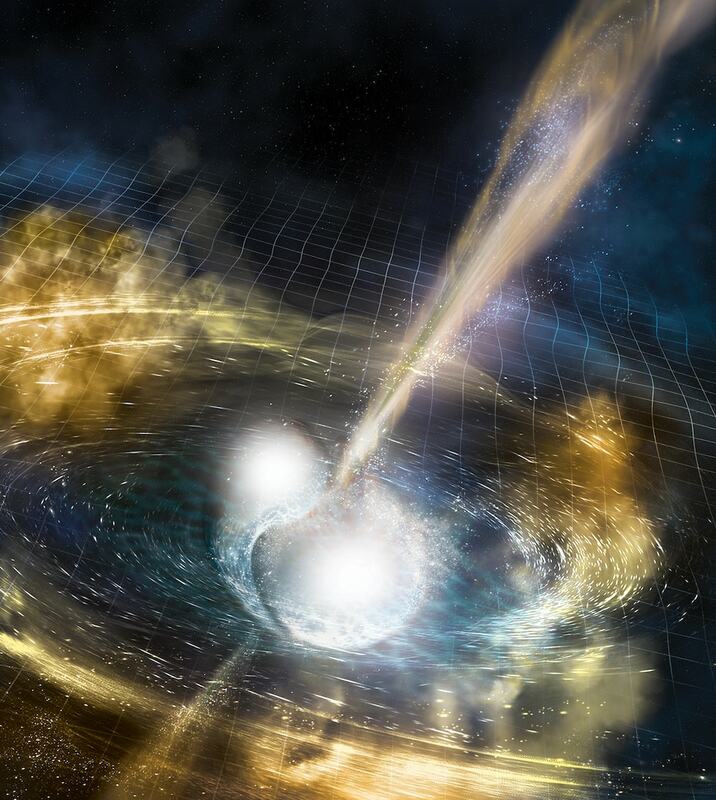 For the first time with this discovery and the addition of the observations of gravitational waves, now we know we’re dealing with a collision of two neutron stars from the gravitational waves. And two seconds later, we see the gamma ray emission arriving. And we finally have proof that collisions of neutron stars are producing these short bursts of gamma rays. That’s another first that came within the first few minutes, and the understanding came within the first few hours of the community analyzing the data. IRA FLATOW: Because gamma rays have always been mysterious. And now we know they come from the collision of neutron stars. VICKY KALOGERA: We have an actual proof. IRA FLATOW: So we’ve settled on gold and gamma rays all at the same time. VICKY KALOGERA: And the expansion of the universe. IRA FLATOW: And the expansion of the universe. What else? DANIEL HOLZ: And the speed of gravity. IRA FLATOW: Oh, that’s been verified? DANIEL HOLZ: Yup. So this was the first time we could measure that gravitational waves go at the speed of light. Now the theory says that it has to, and this is what everyone expected. But now we’ve measured it. We showed– I mean, that gamma rays and gravitational waves arrived at Earth after traveling for over 100 million years. They arrived at Earth within two seconds of each other. So their speeds are to 15 decimal places are the same. IRA FLATOW: We now have something to really be happy about for this weekend. Wow. VICKY KALOGERA: And for much longer. This is only the beginning. DANIEL HOLZ: That’s the truth. IRA FLATOW: Well, we’ll hoist a beer to all you guys and gals for the work you’ve done. Thank you very much, Vicky Kalogera, and Daniel Holz, both members of the LIGO scientific collaboration. Thank you both for taking time to be with us today– very, very informative. Thanks again. VICKY KALOGERA: Thank you. Thank you. DANIEL HOLZ: Thank you for having us. To study human aging, researchers devised a place where worms can check out but never leave.